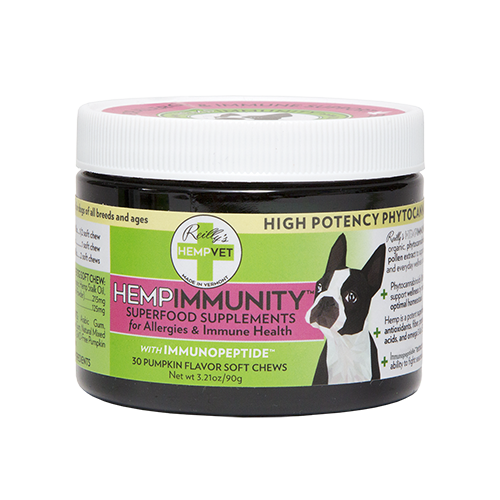 Reilly's HEMPIMMUNITY high potency superfood supplements combine our organic phytocannabinoid-rich hemp complex with Immunopeptide™ to support normal immune response, skin & cellular health and general health & wellness. 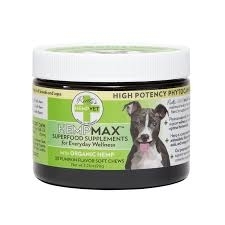 Reilly's HEMPMAX fast-acting high potency supplements contain increased levels of our organic phytocannabinoid-rich hemp blend to support everyday health & wellness in dogs of all ages. This powerful, synergistic, multi-action supplement contains 80+ components, including naturally occurring CBD, EFAs, vitamins (B1, B2, B6, D), minerals (iron, zinc, copper, folate, magnesium, manganese, phosphorus), omega 6 & 3 fatty acids, amino acids, tocopherols, antioxidants, flavonoids, terpenes, fiber, and protein, that provide an “entourage” effect, supporting cognitive, organ, gland, connective tissue and immune cell health via the endocannabinoid system (ECS). 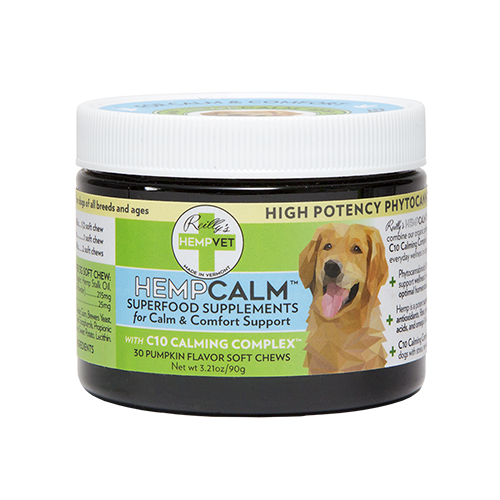 Reilly's HEMPCALM high potency superfood supplements combine our organic phytocannabinoid-rich hemp blend and exclusive C10 Calming Complex™ to support fast-acting calm, relaxation and general wellness in pets experiencing anxiety, stress or nervousness. This powerful, synergistic, multi-action supplement contains 80+ components, including naturally occurring CBD, EFAs, vitamins (B1, B2, B6, D), minerals (iron, zinc, copper, folate, magnesium, manganese, phosphorus), omega 6 & 3 fatty acids, amino acids, tocopherols, antioxidants, flavonoids, terpenes, fiber, and protein supporting fast-acting relaxation in puppies to seniors while contributing to overall wellness by supporting the endocannabinoid system (ECS).